For the past many years, I have publicly and privately acknowledged the July 26th anniversary of the Americans with Disabilities Act. Public recognition of the anniversary was an important part of my role as the Administrator of the Administration for Community Living (ACL), the federal agency that funds a variety of important programs that support people with disabilities and their families. Two years ago, at the 25th anniversary, I attended community and campus events in Lawrence and highlighted the anniversary in Washington, D.C.
One of my favorite aspects of this annual recognition is the company I keep. Many of the individuals who fought at the local, state and federal level for the civil rights of people with disabilities still walk and roll among us. Over the course of my seven years in Washington and during my time in Kansas state government, I have had the pleasure of meeting and collaborating with some of the strongest advocates for people with disabilities in this country. To know the people who created and fought for the ADA is nothing less than an honor. Many of the leaders in this movement are now my friends. Beginning in August 2016, the benefits of the Americans with Disabilities Act were made real for me. On August 2nd of last year, I fell from a ladder (blame the dead mouse in my attic) and sustained a serious injury to my right leg. I shattered the top of my tibia and fractured my ankle. 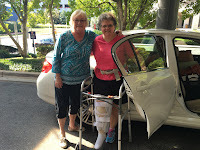 I was in the acute care hospital for six days and inpatient rehab for 12. From August to the end of October, I was totally non-weight bearing on my right leg. In November and December, I regained my ability to bear weight and walk. In January, I progressed to a cane and was released to drive a car. I still use my cane for longer distances and uneven surfaces. I have been living as a person with a disability for the past year. It has been difficult, enlightening, and both encouraging and discouraging. 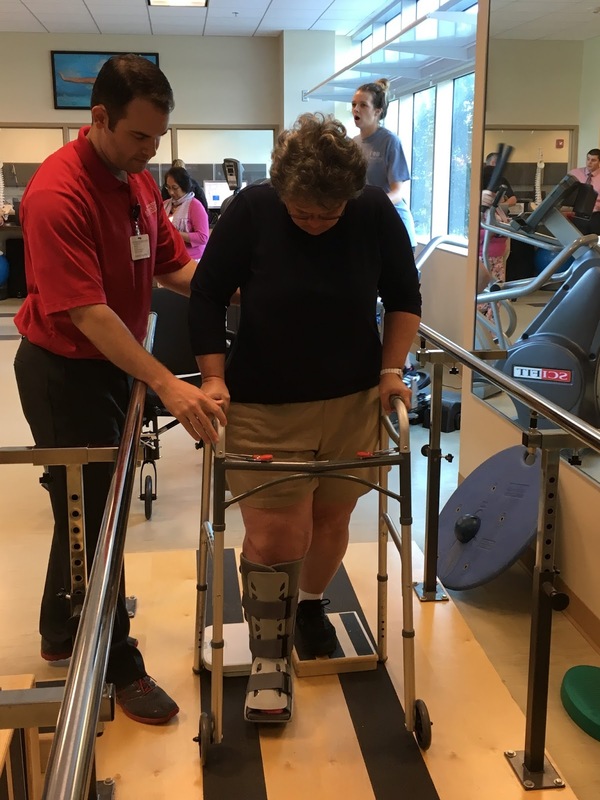 I have new insight and appreciation for orthopedic rehabilitation. I knew it would be hard. The difficulty of rehab is obvious to even casual observers. I didn’t realize it was so scary. I will never, ever, underestimate the difficulty of a transfer for the rest of my life. When I was in the hospital, I characterized a transfer as the intersection of a task and a prayer. It is. Every. Single. Time. It’s just damn scary to swing a broken leg off a bed, stand at walker on one leg, pivot to a wheelchair, or hop to the bathroom. It’s hard to get in and out of a car with an unbendable leg. To board plane I had to hop with a walker, my trusted gait belt strapped around me. Accessible bathrooms are a big deal. I was released to fly home to Kansas in early September. As my partner and I waited at the gate, I made mental bathroom calculations. I knew it would be extremely difficult for me to use the restroom on the airplane. I avoided drinking anything a few hours before my flight. I positioned myself in the boarding area with one eye on the boarding door and the other on the accessible family restroom across the hall. Then I aimed for the window of time when boarding could commence, my gate attendant would arrive and my final mad dash – roll – to the restroom. Just before that important moment arrived, an airport worker from one of the restaurants sauntered alone into the family restroom. And stayed. As we moved into position at the bathroom door I became increasingly angry. That was not his restroom, it was mine. That space is sacred – to the degree a bathroom can be – because it is reserved for people for whom air travel is very hard. Families, people with attendants, people with disabilities, like me. Accessible hotel rooms are farcical. As my healing progressed, I became better at transferring to a comfortable chair. But, once I’m in the chair, I need to be able to get out. We saw numerous hotel rooms and temporary housing that had modern squishy armless furniture in the living area. An armless living room chair in an accessible room is an oxymoron. Or, just moronic. Take your pick. My favorite non-accessible accessible room was one with plenty of floor space for my wheelchair, but a doorway between the living and bedroom area too narrow to roll through. Fortunately, I needed and often found grab bars near the toilet, a roll under sink, and a shower with grab bars and a shower seat. These items should become more standard. And we should stop selling and installing short toilets. I am amazed by how many people are injured, temporarily disabled or permanently disabled. It is humbling to hang out at rehab, whether inpatient or outpatient. People get hurt badly. Lots of them. Lots of us. And while my experience with physical therapy is overwhelmingly positive, even they don’t have a power door on the bathroom. People who have been hurt don’t wear nametags but they do open doors. Dozens and dozens of times someone has held a door for me and said, “I’ll help. 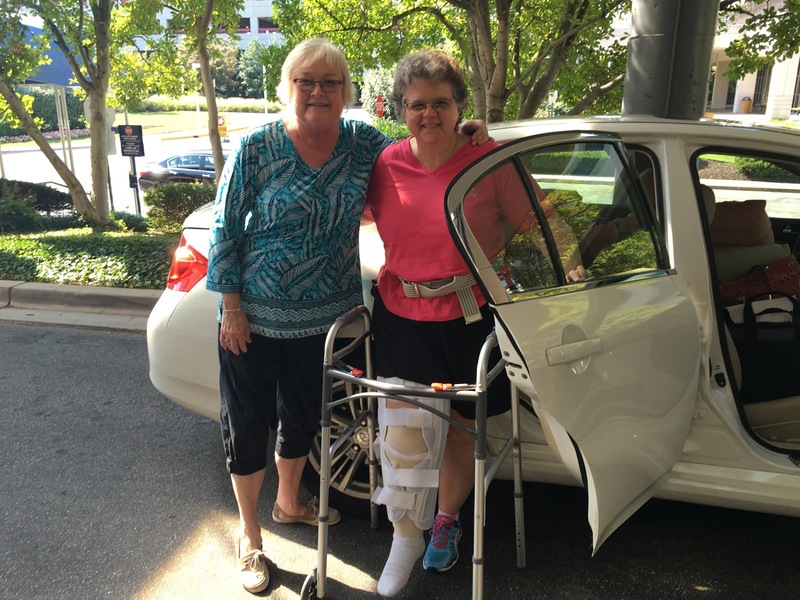 I’ve been there.” People have stopped to help my partner assemble or disassemble my wheelchair. So many strangers have been observant and courteous. And I often wonder how they perceive me. What is the personal and perceived trajectory from injury to temporary to permanent disability? I think it looks like I’ve been injured. Would people react differently if I was obviously disabled? I have come to realize that what people see and what I perceive about myself are complex topics. Not all injuries or disabilities are visible. I was both safe and fearless in my wheelchair. I appreciate it for the liberating device it is, not the confining device able-bodied people perceive it to be. I know so many people who use wheelchairs for mobility. Each of them are teachers to me. As I rolled around rehab, I knew I had role models all around me. Many of my friends and former colleagues use various types of wheelchairs and scooters for assistance. I feel more wheelchair conversant; more like I have enough knowledge to have a capable conversation. During a recent trip to Hawaii, I met with several stakeholders from the disability community and talked with a lunch companion about the progression from a manual to power-assist chair as her MS worsens. I don’t still use a wheelchair but I own one. Moving through that experience was humbling and powerful all at once. Before the next ADA anniversary comes around, I have more physical and mental work to do. I graduated physical therapy with the understanding they had taken me as far as they could. I now work with a personal trainer to improve the strength of my leg and flexibility of my foot. I hope to continue to improve. But, will I? I hope so. I hope to walk unaided for a distance of several miles. I hope to be strong enough to walk a 5K next Mother’s Day. Can I? How permanent is this injury? It’s severe. It’s lifelong. I will likely need knee replacement in the future. Am I a person with a disability? Or am I injured? The bones have healed and I don’t know the answers yet to these questions. I do know the longer I work on issues that impact the lives of people with disabilities, the more I become part of the community. Regardless of the outcome of my inward reflection, I welcome being part of this civil rights movement. The one that works so hard to improve the lives of all people every day. On July 26th, we should all own and celebrate the Americans with Disabilities Act. For my part this year, I also want to say thank you. Thank you to the leaders who fought for the rights of people with disabilities in this country. You opened doors for me decades before I needed your help. Good Death, or Assisted Suicide?